Blank Blue is the surreal story of an Armageddon born out of a massive earthquake off the west coast of the United States and set sometime in the future. The quake triggers a separation of the west from the rest of the country, creating a whirlpool of devastation in its wake. Millions die. Thousands survive. Those that survive eventually sink and drown from the buckling lands, only to have scores of poison mushrooms waiting for them underneath the earth's masses, loosened from centuries old trees. The poisoned water gives them their first gasp, and miraculously they are able to and breathe and live underwater. The album tells the story from various points of views, from an all-knowing narrator, to a psychic fish that warns people via their dreams, to random characters who watch their loved ones drown or ask the others underwater how to find the ability to breathe. The confusion and sadness is balanced by the fascination of having to start everything all over again; learning how to breathe and swim etc. Elvin Estela, aka Nobody, met Niki Randa at Fingerprints, an indie record store in Long Beach, California, where they have worked together since 2001. Estela was mulling over ideas for a sequel to Pacific Drift, his 2003 release on Ubiquity, and realized that the album he wanted to make needed only one vocalist. He had often heard that "Niki can sing!" and eventually would give Randa a CD-R of beats and tracks that he was considering for his new album to see if she was interested in being the one. In December 2006 the first of their collaborations was finished and given the working title "Sonic What?!" Excited with the results, Estela immediately told Randa about the concept for an album which had come to him in a series of nightmares. Shortly after the two ventured to a book store during their lunch break, grabbed a book blindly, opened randomly, and put Randa's finger to a page which read "Blank Blue." The god's had christened their project (it's both the album's namesake and the name given to the collaboration between Estela and Randa) and for the next twelve months, Estela and Randa would eat, sleep, drink and smoke Blank Blue. "I started to think about making an album that I would want to listen to, that reflected the music that I love to put on and space out to. I loved albums where one vocalist takes you through a journey through different sounds and styles. Niki was the first person I trusted with my idea of Blank Blue and her voice matched the music perfectly. It also helped that we have worked together at a record store for 7 years so we were official record store geeks," says Estela. 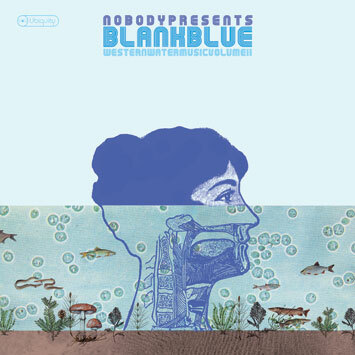 Nobody presents Blank Blue: Western Water Music Vol. II is the official follow up to the 2003 album Pacific Drift: Western Water Music Vol. I. In the five years between albums, the 31 year old Los Angeles producer has traveled the world touring with the likes of The Mars Volta, Prefuse 73, Battles, Edan, Dntel, and Flying Lotus. Blank Blue is another example of the strength of the current wave of beat music created in Los Angeles. Estela's own Wednesday night weekly, called Low End Theory, is built around this sound. Born in November 2006 it continues to draw hundreds weekly. Along with Daddy Kev (Alpha Pup Records), D-Styles (Invisible Scratch Pickles), Gaslamp Killer and MC Nocando, Estela hosts a crowd pleasing night with experimental artists from across the world including Prefuse 73, Sage Francis, Busdriver, Grouch, Entrance and Sa-Ra Creative Partners. The night bi-monthly feature called Beat Invitational invites producers from around Los Angeles to showcase their most recent/unreleased work and Daedelus (Ninja Tune), Flying Lotus (Warp), Ras G, Edit, Thavius Beck and Nosaj Thing are all regulars. Visitors will be blasted by a stoned haze of deep and aggressive bass lines and loose drums that swing on and off rhythm. The sound is undoubtedly influenced by the late hip-hop producer James (Jay Dilla) Yancey who had a huge impact on many producers in Los Angeles and beyond. Madlib, Dabrye, Prefuse 73, Dimlite, Hudson Mohawke, Red Nose Distrikt and Elliot Lipp are other favorites amongst the DJs. With Blank Blue Estela sought out a sound that keeps the sensibility of Low End Theory while structuring tracks into songs with full vocals and instrumentation. The term Western Water Music was inspired by jazz musician Gary Bartz and his Harlem Bush Music Vol. I and II album. "I just love that he named his own style of music and decided to form his music under this guise. He simultaneously represents his own genre while also representing where he is from. It also seems to say that Harlem is a big part of his sound," says Estela. "I took this very seriously and thought that I would do the same. To me, music is definitely your subconscious reacting to your experiences and surroundings. So, I decided that this sound would be Western as in West Coast and it would be inspired by the water." Estela wrote and produced the album in his Long Beach home studio, he also wrote some of the lyrics. Some songs came together during improvised-takes and were worked-on subsequently over a period of time, and others would happen on the spot as soon as Randa heard the music. Most noticeably different on this record, in comparison to his earlier releases, is the extensive use of instrumentation, either from Estela, who started messing with the guitar as he recorded Soulmates, or guest musicians. After getting the frame of the song together, the two would have friends come over to listen for anything they could add. An afternoon of drinks would end with an evening of amazing backwards guitar solos from neighbor and friend Josh Teague. Old friends from KXLU, Estela's college radio station and home to his current 60's psychedelic show She Comes in Colours, Ben Knight (The Tyde) and Farmer Dave Scher (Beachwood Sparks) dropped by with tons of toys and embellished a few of the songs. Miguel Atwood-Ferguson who has arranged for the likes of Dr. Dre, Kanye West, Carlos Nino and Daedelus adds his signature strings to seven of the twelve songs. It's a vision of sound brought to life by really good friends. Hard pressed to pigeon-hole the album Estela says "I would describe it as psychedelic bass music because there are the two things that matter to me when I'm listening to music. Gotta' love the bass, gotta' love the layers, and my third eye's gotta love it too." He adds, "This is my dream record. I've always wanted to have a concept record that revolved around one theme. I feel that this is the first record that I've done where I understand the song making process more than ever. In previous albums I would learn as I went along. With Blank Blue, I knew what I wanted to do going into it. I am also more inspired by the present than the past right now as well as the concept of future music. I feel that Los Angeles is just starting its incline with a new generation of awesome electronic artists that I can luckily call me peers. I am inspired by what's going on around me right now, and I am happy to do my take on what's happening and put my spin on it. I'm also very lucky that one of my good friends ended up being my main collaborator, as I don't think the record would have come out the same if I didn't fully trust Niki and her ideas and vice-versa." In addition to touring around the world, Estela also kept himself busy between Ubiquity releases with multiple side-projects including the 2005 b-sides album And Everything Else on the Los Angeles-based Plug Research label and in 2006 a full length collaboration with Mystic Chords of Memory Tree Colored See on Mush. He also released a collection of his remixes on Plug Research featuring reworks of acts as disparate as Postal Service, Phil Ranelin, The Free Design and Her Space Holiday. In 2007 he was involved with his first hip-hop project since Soulmates, his debut for Ubiquity in 2000, working on Busdriver's critically acclaimed Roadkillovercoat on ANTI/Epitaph.